Monday – Homemade turkey sandwich on an everything bagel in a bento box with watermelon and pineapple. Granola bar and apple for late afternoon snack. Tuesday / Wednesday – Off for 4th of July. But I ate at home for the good of the challenge. 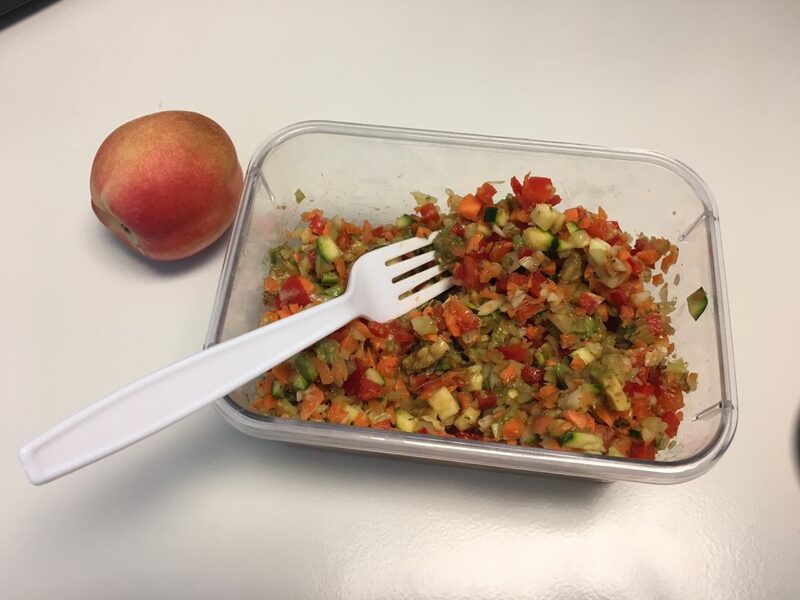 Thursday – Half of a bag of grocery store pre-bagged kale salad, with a side of apple and white nectarine. Friday – Stared at second half of kale salad. Gagged a little. Forced down ¾ of the salad. Rewarded myself with a donut from the office kitchen. (Hey, I still didn’t spend money!) Washed it down with a white nectarine. 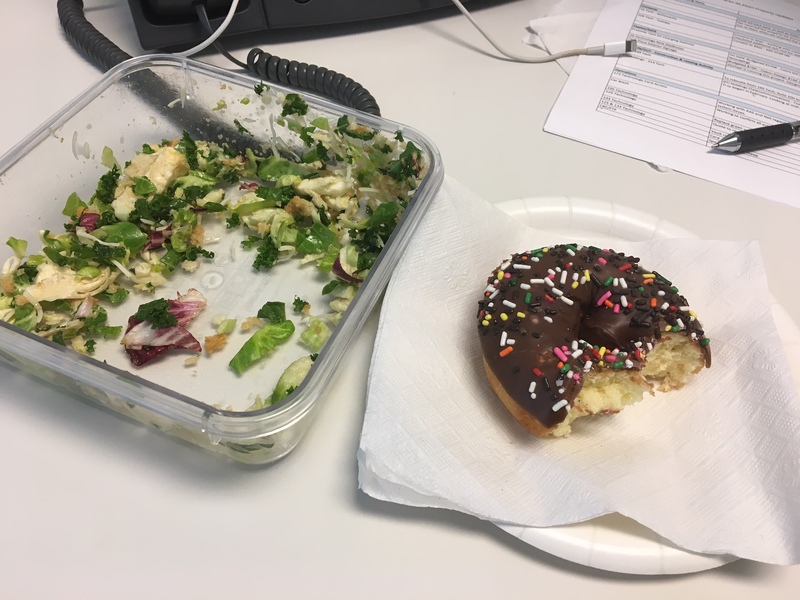 Second-day grocery store pre-packed salad washed down by donut. 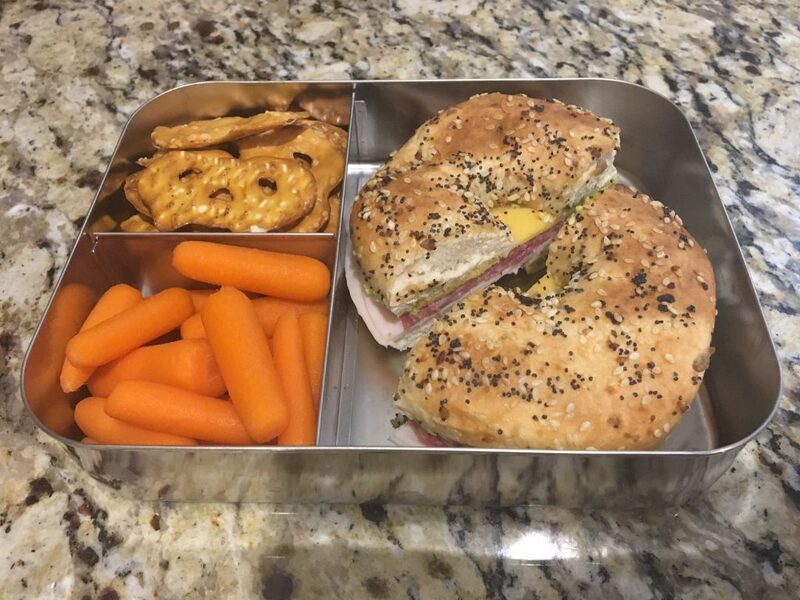 Monday – Turkey and avocado sandwich on a bagel in a bento box with pretzels and grapes. Wednesday – Pre-scheduled lunch with a colleague. I thought about bringing a lunch but decided it wasn’t appropriate. Begrudgingly spent $11 on a chicken club sandwich, but it was delicious. Thursday – Leftover Mediterranean salad from dinner two nights ago. Avocado and zucchini make it a little more hearty. White nectarine for a little sugar. Friday – Turkey and avocado sandwich on a bagel. Again. Monday – Leftover carne asada burrito from Sunday’s barbecue. Forgot the toppings at home (guac, lettuce, cheese, pico de gallo). It was delicious anyway. Trader Joe’s makes the BEST pre-marinated carne asada! 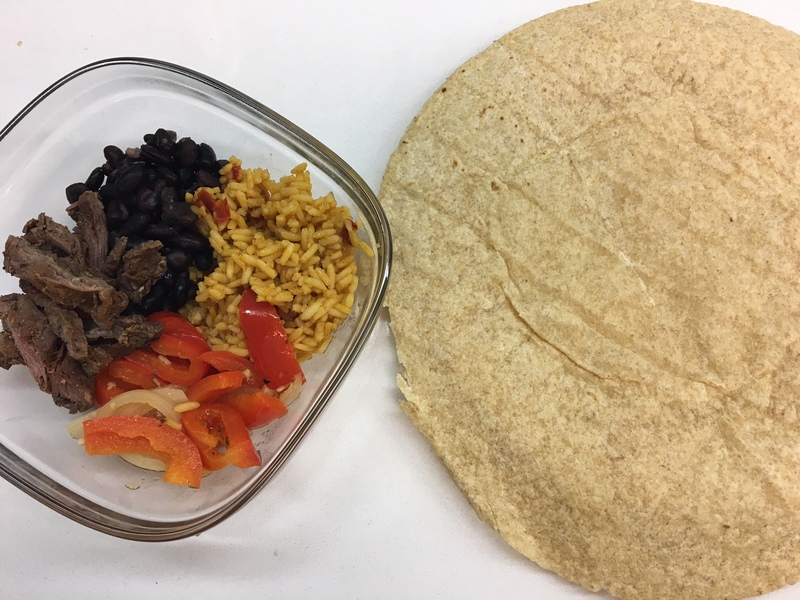 Tuesday – Today was “snack for lunch” day. I ate a granola bar, whole wheat english muffin with almond butter, and fruit for lunch. And topped it off with a cookie from a coworker’s bridal shower. Wednesday – My go-to lunch again: turkey and avocado sandwich on a bagel. I got crazy and added some salami. Side of carrots and pretzels. Thursday – Had a bad day. Felt lonely. Called up a colleague and met for a spontaneous and long lunch at Panini Cafe in the shade on their patio. Totally worth the $15. Friday – Scrambled to put something together at the last minute and went with the classic bagel sandwich, carrots, grapes and pretzels. This is definitely my most-used lunch. Tuesday – Toast with avocado, fruit, and a handful of almonds. I was hungry about 30 minutes later and snacked on whatever free food I could find around the office. Wednesday – All-day leadership training class meant I got a free catered lunch from Luna Grill. It was nice to have a real meal and not have to pay for it. 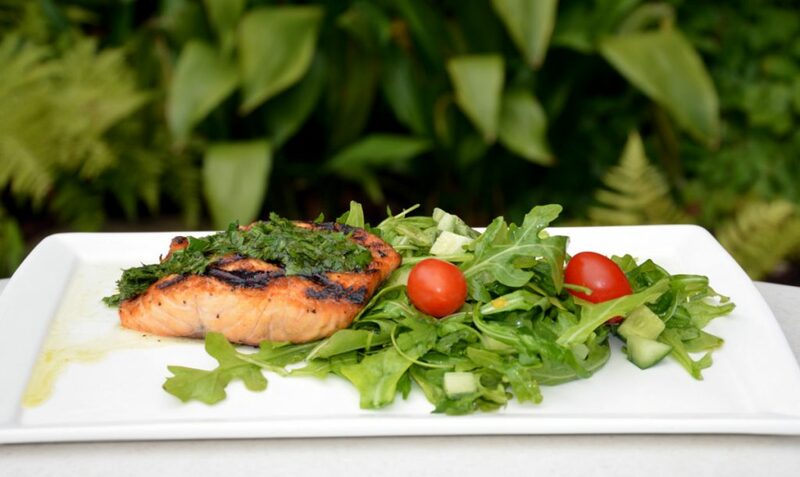 Thursday – Made a simple salad with a store-bought pre-marinated filet of salmon and put it on top of a bed of arugula with a bit of chopped cucumber because that’s all I had left in my vegetable drawer. Added some lemon and olive oil as a dressing. It was surprisingly filling. I forgot to take a picture, but it basically looked like the one below (minus the cherry tomatoes). A much fancier-looking version of the one I made myself. Friday – Finished off the month with leftover lamb, mashed Yukon gold potatoes, and sauteed zucchini. It was leftover from a fancier-than-normal dinner we cooked the night before. It was a little too heavy for a weekday lunch and I found myself in a food coma for the bulk of the afternoon. I think I’m learning in these monthly challenges that moderation is key. It’s not sustainable for me to make EVERY. SINGLE. LUNCH. It was also an awfully lonely month because I didn’t get out much with coworkers and ate lunch almost entirely at my desk. Out of 18 work days, I only paid for a lunch out twice. That is a major win in my book. I was able to take away a few things from this challenge. Namely, that I uniquely tolerate bagel sandwiches. And that eating lunch at my desk this much is depressing. But also, I am capable of finding ways to keep costs down without putting my meals on repeat to the point of insanity. People out there are much better at this than me. I’m sure I’d do better if I planned more, but hey, this is real life. And in real life, I’m really bad at planning what I am going to eat. Great ideas! I will definitely steal some of these. Do you have to make lunch for the kids? With school starting up again in two weeks, I’ve been struggling with figuring out what lunches I can make on Sunday for the week ahead but that won’t be soggy/dried out within a few days. I’d love to hear any ideas! 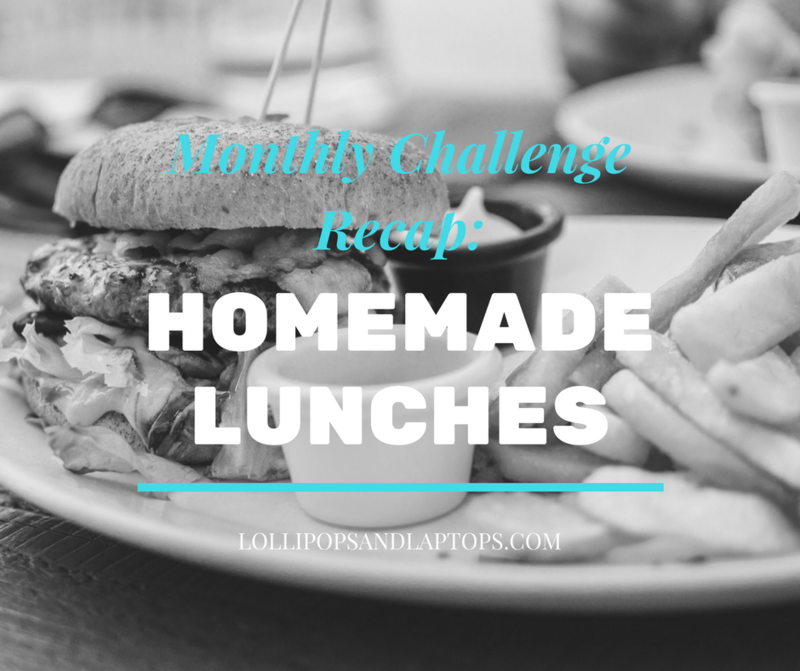 I’ve been pinning ideas like a mad woman trying to come up with more than just the basic turkey sandwich I currently make for R. They’re moving to a new school next month and that school’s lunch menu is pretty sad and twice as expensive as their current school so we’re going to have to move to homemade lunches for both kids every day. I’ll send you some of the pins I’ve found that may work for my picky toddler!